Here is my card for this week's Color Throwdown challenge. 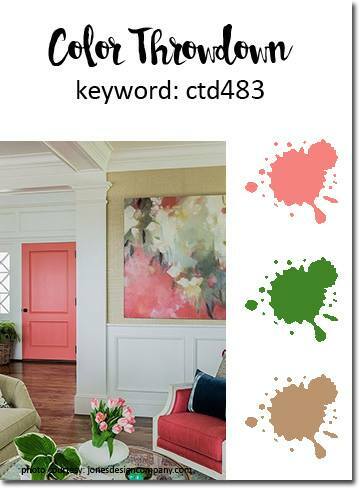 The colors for this week's projects are coral, green and kraft. Can you believe how gorgeous this room looks? I think it all starts with that door! I used the Monogram Collection - H stamp set from Concord and 9th for my card today. I own the H, the T, and the Heart stamp sets in this collection. They are so much fun to use. I also included one of the panels I stamped yesterday using the Fleur 1 stamp set from Pinkfresh Studio. I used three ink colors from Gina K. Designs and two Copic markers to achieve the look I wanted. I didn't do any shading - mostly because my cat was in my chair, so I had to do my coloring standing up. On the inside I stamped Hello Friend and one additional flower. You can click right here for the link to participate if you would like to join in the fun at Color Throwdown. This is just the first day, so you have lots of time to play along! Wow! So pretty! I really love those delicate flowers! Thanks so much for joining us at the Color Throwdown this week!